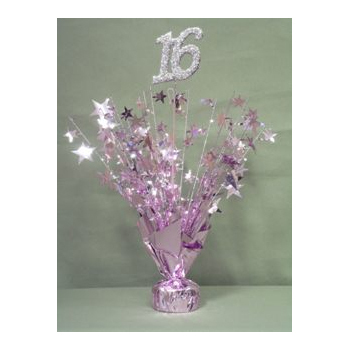 16th Birthday Balloon Centerpiece is a weight covered in pink metallic material. 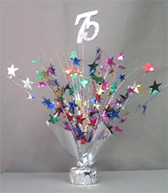 Pink stars burst out with a large pink “16” standing 14″ tall. 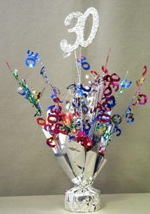 Use a Balloon Weight Centerpiece with our without helium-filled latex or mylar balloons! 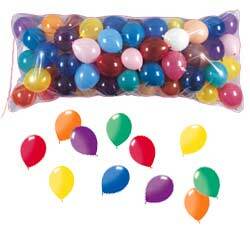 These balloon weights make great centerpieces. They are heavy enough to hold a lot of balloons, but they also look good just by themselves. 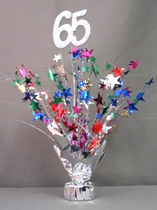 They are age-related and have the age in glittered foam at the very top of the centerpiece. Perfect for centerpieces, just fluff them out a bit, tie on balloons if you like and set them in the center of the serving table or gift table. Great for a quinceañera celebration.